Anomalies in near surface air temperature over land (1979-2008) averaged over Asia and the months of June-July-August from CRUTEM4 (green) — and as simulated by atmosphere/land models in which oceanic boundary conditions are prescribed to follow observations (gray shading). See text and Post #32 for details. This is a follow up to Post #32 on Northern Hemisphere land temperatures as simulated in models in which sea surface temperatures (SSTs) and sea ice extent are prescribed to follow observations. I am interested in whether we can use simulations of this “AMIP” type to learn something about how well a climate model is handling the response of land temperatures to different forcing agents such as aerosols and well-mixed greenhouse gases. If a model forced with prescribed SST/ice boundary conditions and prescribed variations in the forcing agents does a reasonably good job of simulating observations, we can then ask how much of this response is due to the SST variations and how much is due to the forcing agents (assuming linearity). If the response to SST variations is robust enough, we have a chance to subtract it off and see if different assumptions about aerosol forcing, in particular, improve or degrade the fit to observations. 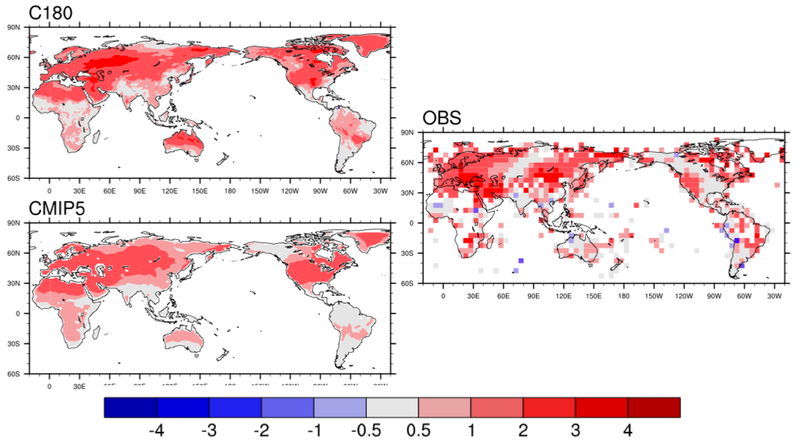 In post #32, the focus was on the annual mean land temperatures averaged over the Northern Hemisphere. If you look at the model simulations in different seasons, in this prescribed SST/ice context, you see a lot more variation from realization to realization in winter than in summer due to internal atmospheric variability. If we are interested in confronting models with the observed spatial structure of trends over land, it helps to look at the system in such a way as to minimize the influence of internal variability. Focusing on summer is one way to get started. The idea to focus on Asia in addition is partially to try to maximize the influence of the forcing agents as opposed to the SST influence, but our AMIP simulations suggest that the spatial structure of the summertime trends is also less noisy over Asia than over N. America. There are more systematic ways of doing this, needless to say, but I think looking at Asia in summer might be a good way to get a feeling for whether this is worth pursuing. The figure at the top of this post shows the spatial mean of 2m land temperatures in June-July-August over Asia (35E-170W, 7N-83N) from CRUTEM4 in green. 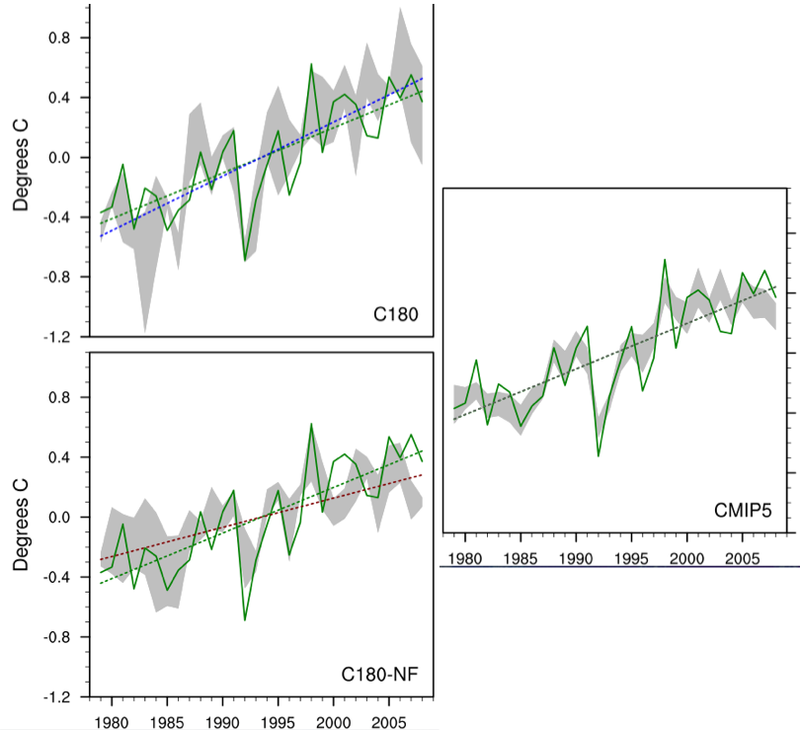 As in #32, the AMIP simulations from 17 models in the CMIP5 archive are first averaged over all available realizations for each model, and anomalies are computed from the mean over the 1979-2008 period. The shading in the figure on the right shows the 25%-75% range of this ensemble of model anomalies. The figure on the upper left shows the result from one of our atmosphere/land models, HiRAM C180. To confuse matters the shading here indicates the spread among three realizations, a measure of internal variability. The figure on the lower left is generated with the same model but including only SST and ice extent variations, holding the forcing agents fixed. 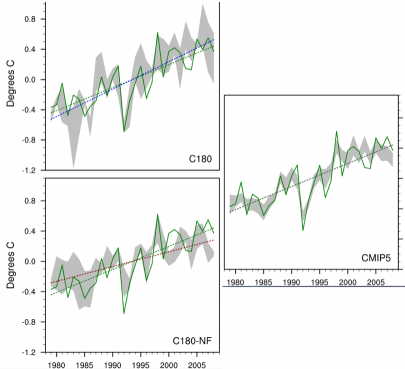 The temperature trends in the CMIP5 ensemble are very close to the observational estimate, while the C180 model’s trend (upper left) is a bit high — one anomalously cold season, in ’83 near the start of this time series, seems to be partly to blame. With forcing variations removed (lower left), the C180 model trend is reduced by more than 40%. It is nice to see the cooling due to Pinatubo appear so clearly in the summer of ’92 (the eruption was in June ’91). It is well simulated by the models without any additional smoothing or removal of ENSO effects. Of course, some of this is coming from the observed SST response, which is imposed here. From the “attribution” implied by the figures on the left above, it seems that about 1/2 to 2/3 of the cooling over Asia in the summer of ’92 is communicated from the ocean, the rest coming directly from the volcanic forcing. Putting the summertime trends over Asia in a global context, here is the observed spatial pattern of 30 year June-July-Aug trends as well as the results from the mean of the CMIP5 ensemble and the mean of our 3 C180 realizations. The numbers on the color scale are in degrees C/30 yrs. In the OBS=CRUTEM4 plot, white means that we felt that too much data was missing to compute a trend; gray, as in the other plots, means that the absolute value of the trend is less than 0.5C/30yrs. The relatively small summer trends in this 30 year period in the eastern half of the US and in a curious slash through central Asia are some of the interesting discrepancies between these observational estimates and the mean of these model ensembles. The remainder (on the right in the figure), which we interpret as due to forcing variations, is also interesting. The cooling or lack of warming over the southern half of the continent is presumably due in large part to aerosols. I don’t think Pinatubo torques the trend very much since it occurs close to the middle of this time period, but that needs to be checked. There does seem to be some potential for constraining aspects of the anthropogenic aerosol forcing with this approach. « 33. Can we trust simulations of TC statistics in global models? Nice post. With the CMIP archive and the HiRAM runs, there is a lot of model data here. Would it be possible to post an additional OBS plot in the 2nd figure showing a TLT measurement – because as good as CRUTEM4 may be, a verification check would be nice. For instance, would the gray slashes across central Russia and the US be apparent in the TLT data as well? I made a plot for my own purposes and there is good general agreement between the RSS gridded data for the same time period including the gray slash across central Asia. it is interesting to see that the effects of forcings and SSTs in the model over Asia are basically opposite dipoles (warming to the North/ cooling to the south, and vice versa) – if the SSTs include some of the warming from the forcings, that means that there’s a synergy between the direct and indirect (mediated through SSTs) effects of radiative agents to warm the land surface consistently ? About the cooling from SSTs in the North: I’m a little bit surprised that at such high latitudes, even in summer, seasonal-averaged temperature and precipitation would be anti-correlated through soil moisture dynamics – couldn’t it be an effect of increased cloudiness in the model, if there’s any (e.g., assuming more evaporation over the Arctic) ?